The Super Bowl isn’t just a Sunday afternoon world championship game. It’s a week-long event with massive TV coverage. Cameras and TV crews from around the globe congregated on this year’s Super Bowl city, Houston, TX, where the game was played in the NRG Stadium. The Broadcast Bridge’s Part 2 of Super Bowl coverage, we look behind the RF systems, cell technology and streaming systems required to support the broadcast and fans. Broadcast crews filled the RF spectrum with signals during the run up to Super Bowl LI. The broadcast and news crews are visible on the streets and in venues including the NFL Experience at the George R. Brown Convention Center, NFL On Location, Media Row and team headquarters. The question might be, how did all those broadcast teams get their signals live back to their stations and networks? With an estimated 3,000 frequencies used by over 10,000 radios at the week-long event, having clear communication and program links was top of mind for a small, but highly trained coordination crew. These experts were charged with making sure all the backhaul and comms channels work in a super-charged atmosphere. Contribution networks weren’t the only RF hogs at Houston’s NRG Stadium. The 72,000 fans eager to share the experience with friends over the internet and social media could quickly overload the normal services. Companies including Sprint, Verizon and AT&T installed COWS (not the milking kind) around key venues to handle the extra load. 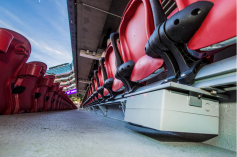 Under seat enclosures at last year's Super Bowl at Levi stadium provided Wi-Fi access for fans. This year's installation at NRG stadium is similar. Once inside the stadium, Wi-Fi was key to fan satisfaction. To serve those customers, an additional 1260 Wi-Fi access ports were installed in the stadium complex. Want to know more about RF, cell, and streaming technology used at the 2017 Super Bowl? The exciting details are just ahead.